Manchester City's chances to claim the League title may have vanished today in their 0-1 loss to Arsenal. Manchester United stand a full 8 points away from the "Citizens" and are likely to lift the trophy once again. To make matters worse, Mario Balotelli won't even be there to help his team in case the mathematics hold up and United has a bad run of form. And this may be the Achilles heel of Manchester City: over-reliance on megastars with egos to match. As much as we'd like to acknowledge Roberto Mancini's puppeteering, it is clear that this team's concentration and decision-making comes down to who is willing to play as a team. Tevez sure felt he deserved more early in the season and was handed a near-season-long banishment from the pitch by Mancini. The Argentinean refused to be used as a substitute in a game when called by Mancini. Why? So many stars vying for the forward role: Dzeko, Aguero, Balotelli, Tevez. And yes, he should always go first, right? United has their share of talented forwards that are all pretty content. You can argue that Rooney isn't the most obedient of persons but Sir Alex Ferguson has managed to tame the Englishman to a point that he follows his coach's directions well. Chicharito, Welbeck and Berbatov enjoy their rotation and are aware their services are better suited for certain games. Then there is Balotelli. The Ghanaian-Italian has a history of misconduct and is regarded as a brilliant, although temperamental player with unpredictability to match his ego. When he's on there are few that can stop him. When he's off or his team is losing, he forgets how important and talented he is and pretends to be playing street soccer or video games. Yes, in a video game you can take out your frustration by tackling an opponent for no reason. In real life there are consequences: his deliberate tackle resulted in a silly second yellow card that, because of previous offenses, means that he's suspended for 5 games. Sport has a history of "bad boys" and it ranges from the NFL's Ochocinco to Ecuador's Kaviedes. Never quite patient enough to understand their talent and how valuable they are to the sport. Balotelli and Tevez both cost Manchester City many points this season and for this reason above all are likely to miss an opportunity to win a title for the first time in over 40 years. 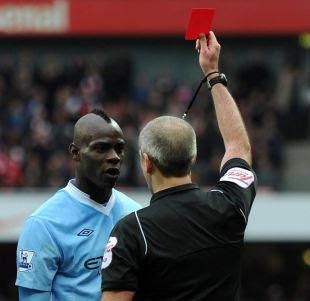 A steady hand is required for guiding players like Mario and it is clear that Mancini has been unable to do this. Can anyone do it? Will Mancini return next season? Will Balotelli? We shall know part of the answer to these questions within the next few weeks.